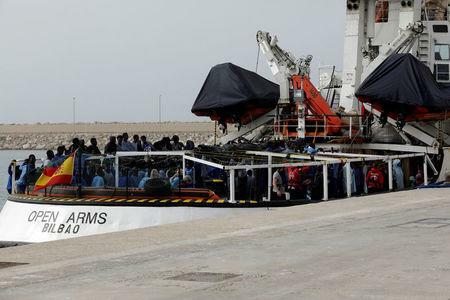 ROME (Reuters) - Italian authorities seized a charity's ship on suspicion it had helped illegal immigration by picking up migrants in the Mediterranean instead of letting Libya's coastguard take them back to North Africa, the aid group said. 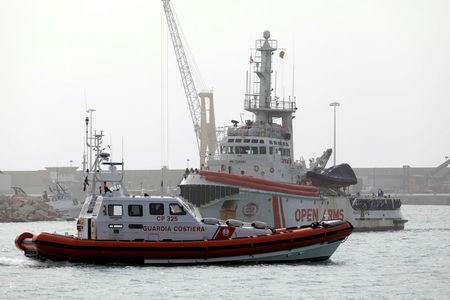 The Spanish charity Proactiva Open Arms picked up 218 migrants who were in unsafe rubber boats in international waters off Libya's coast on Thursday, then took them to Sicily, the Italian coastguard said. 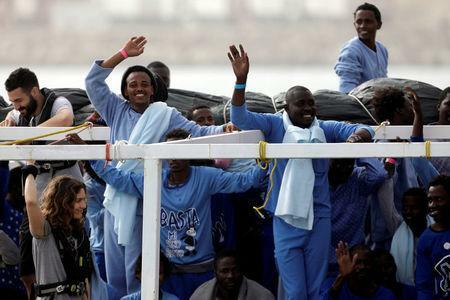 A Sicilian court impounded the boat late on Sunday on suspicion that members of its crew had violated international agreements on handling migrants and helped illegal migration into Europe, the charity said. There was no immediate comment from the court in Catania. The case highlighted an increasingly tense stand-off between humanitarian groups seeking to save lives on the open seas and authorities across Europe trying to stop people from making the dangerous crossing in the first place. It also comes at a sensitive time in Italy after voters this month backed parties that took a hard line on immigration and promised to deport hundreds of thousands of irregular migrants already living there. "Finally an Italian prosecutor who blocks human trafficking," Matteo Salvini, the leader of Italy's anti-immigrant League said on Twitter, commenting on the court decision. Proactiva released footage that it said showed a young boy sitting in his father's lap on its ship after the rescue. "He would have never forgiven us had we returned him to hell," Oscar Camps, the founder of Proactiva, said on Twitter. The United Nations has said migrants - hundreds of thousands of whom remain in Libya - face dire conditions there. Those who make the crossing tell of being extorted, beaten, tortured, raped, starved and forced to work for no pay. "In these situations, the priority is to save lives and that is what we did," Camps old reporters on Monday in Barcelona. "The challenges (for rescuers) are increasing. The tone of the debate is becoming more heated and we have seen a campaign to delegitimise NGOs working in the Med. Today rescues have become criminal offence," Camps said. Proactiva's lawyer, Rosa Emanuela Lo Faro, dismissed the charges, and told Reuters it did not know about any international agreement with Libya. It is the second time Italy has seized a rescue vessel. A German ship, the Iuventa, was impounded in August on accusations it had aided illegal immigration. The group, Jugend Rettet, also denies the charges and is seeking to get the ship back. Italy has agreed to hand over full responsibility for sea rescues across about a tenth of the Mediterranean to Libya's coast guard by 2020. The country has been on the frontline of boat migrant arrivals for the past four years, when more than 600,000 migrants have reached the country's shores. The issue has become increasingly politicised across Europe. Both Hungary and Poland are refusing to take in EU quotas of migrants. German Chancellor Angel Merkel lost ground to anti-immigration parties in last year's election, partly as a result of her decision to let in hundreds of thousands of refugees in 2015. Vincent Cochetel, the U.N. refugee agency's special envoy for the central Mediterranean, said on Twitter he hoped the case did not mark a return of what he called "the campaign we saw in 2017 against NGOs involved in rescue-at-sea".